Dyadic relations enjoy yet another form of graph-theoretic representation as labeled bipartite graphs or labeled bigraphs. I’ll just call them bigraphs here, letting the labels be understood in this logical context. 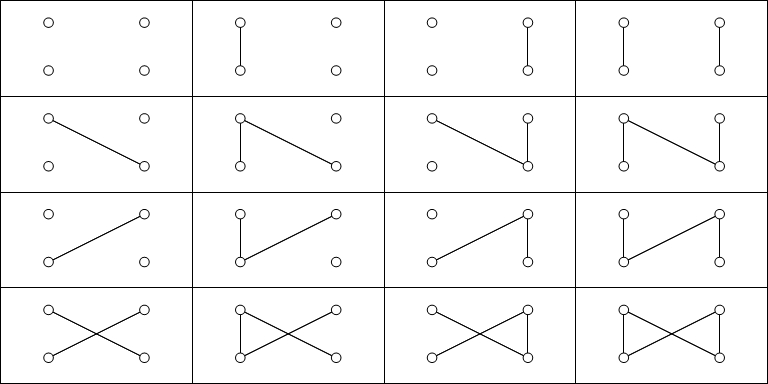 The figure below shows the bigraphs of the 16 dyadic relations on two points, adopting the same arrangement as the previous displays of binary matrices and loopy digraphs. This entry was posted in Dyadic Relations, Graph Theory, Logic, Logic of Relatives, Mathematics, Matrix Theory, Peirce, Relation Theory, Semiotics, Sign Relations, Triadic Relations and tagged Dyadic Relations, Graph Theory, Logic, Logic of Relatives, Mathematics, Matrix Theory, Peirce, Relation Theory, Semiotics, Sign Relations, Triadic Relations. Bookmark the permalink.